Jam jars store jam, the Sun jar collects and stores sunshine so that you can use it at night. Made with a traditional Mason jar and high tech energy lighting! 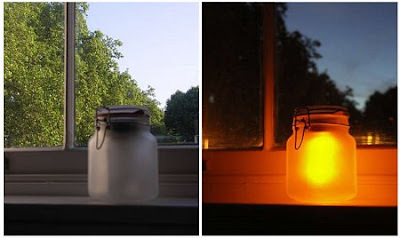 Captured inside the jar are a highly efficient solar cell, rechargeable battery and low energy LED lamps. When the Sun jar is placed in sunlight the solar cell creates an electrical current that charges the battery over a few hours. This energy is then used at night to power the three LED lamps inside the jar.